I’ve known Nicole for many years and is probably one of my best t-friends. I met her on my first night out ever and I am very happy to have gotten to know her so well. Nicole is probably one of the most famous t-girls in Minnesota; I can’t tell you how many times I’ve had people ask if I know her or found the MN T-Girls through her. I am proud to feature her in T-Girl Spotlight. Hi. I am Nicole Spencer. I identify as transgender. I have known Hannah for a number of years and have attended many of her MN T-Girls activities/events going back to the first one in late 2013. 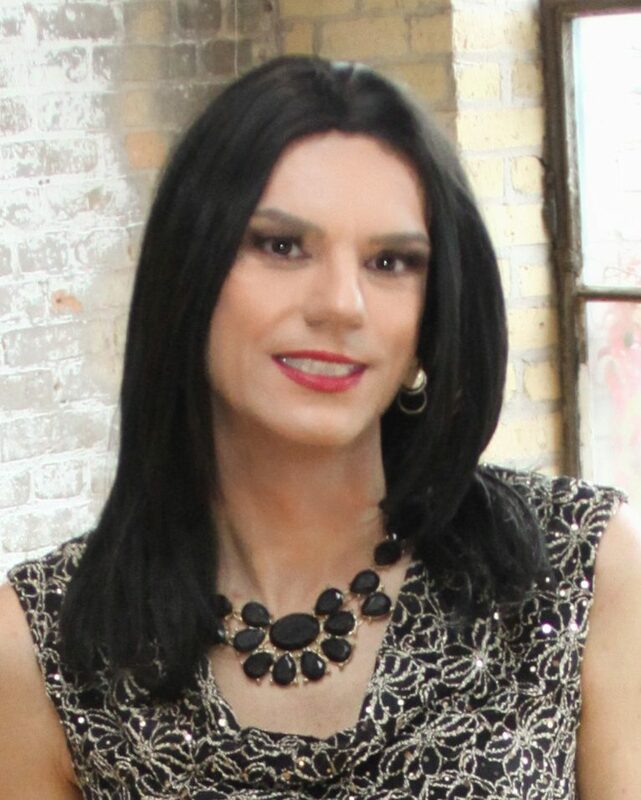 I thank her for asking me to be part of her T-girl Spotlight series. I am divorced and have two adult children, 24 and 27, both of whom know about Nicole. Both kids prefer not to see me as Nicole, but accept that I am who I am. As far as I know, my ex-wife still knows nothing about Nicole. I started crossdressing at approximately age 10, although I do remember ‘playing house’ earlier than that and occasionally was a female then too. I have always loved high heels. They are my weakness. Heels are where I started, then worked my way upward as i dressed more adding nylons, then a dress or top/skirt, then the lingerie under the dress, as time moved forward. Finally as I aged even more, I added a wig and makeup. To this day, I most often buy shoes first, then find an outfit to match. I was in “the closet” for way too long. I didn’t go out in public until Spring, 2009, and that was just to another t-girl’s house for some makeup lessons. I finally went to a public venue, the Town House Bar in St. Paul, MN, for the first time in July, 2009, at age 46. Since my kids didn’t yet know, going out was both rare and at random times. Things have changed since talking to my kids about my Nicole side. I now go out at least once a week, sometimes two or three times a week. I have Hannah to thank in part for that. Having participated in numerous MN T-Girls gatherings, it’s been a group that has helped me gain confidence and be comfortable with who I am. It’s helped me “own it.” I gain more and more confidence and become more comfortable each and every time I go out. I have also gained friends and supporters from this group. Online social media has also helped me spread my wings. I have gained a number of friends by socializing online. I am on Facebook. Thanks to the available communication tools and thanks to people who travel for whatever reason, I have had the chance to meet a number of people in person, starting with a business traveler who happens to be a t-girl. After meeting her locally a few times, I decided that it was time to take to the road. Yes, Nicole travels. Locally, I have been all over the Twin Cities and it’s suburbs. Getting out of Minnesota, I have taken girl trips to Chicago and Detroit. I have met some fantastic people in both of those cities whom I can now say are friends. I am comfortable in both cities. One last thing. Whether you’re new to this lifestyle or have been living it for years, if we happen to cross paths, please say hello. And if you live in the Minneapolis/St. Paul area or happen to be here as a visitor, please check to see if Hannah is hosting an event. They are terrific opportunities to get out and be yourself. Wow, what a wonderful post. I can’t think of a better person to spotlight as I have never met Nicole in person I do know her on facebook. Nicole is truly an amazing person inside and out in out, and one day I hope I can have the pleasure to say “thank you, my sister, for being in my life even though, my life is crazy with school. Thank you Sheila Marie. Talking on FB isn’t the same as talking in person, so I look forward to the day we can meet. pretty hats off to you. Hannah, is there a TX-T group that you know of? Interesting, my daughter had the same reaction to wearing heels. Thank you for the lovely compliment. Thanks Lisa for the kind words. My daughter had the same reaction when she saw the heels I wear. Lovely article and Nicole is such a sweetheart. I can so identify with starting with heels and working upward as time when by as heels always hold a fond spot for me as well to this day. I’ve only meet Nicole through Facebook thus far. However, she has been just wonderful to chat with and she is always full of encouragement. So looking forward to the day I get to meet her in person. Until then she will remain one of my dearest friends on Facebook and she always makes me feel special.